Cell and SmartPhones Damage Relationships – Kathy J. Marshack, Ph.D. Does it bother you when you try to have a conversation with someone and they keep their cell phone in hand, ever ready to interrupt you in order to send a text or talk to someone who calls? You say it doesn’t? Well, research is showing that it really can have a larger impact on our relationships than you might think. Concentration: American Psychological Association published a study wherein the participants were asked to perform a task – some with the cell phone visible, some without. And they found that the ones who could see the phone did nearly 20% worse on the task. Their minds were distracted by the possibility of receiving a call or message. Quality of Conversation: Virginia Tech did a follow-up study that confirmed that visible cell phones change the actual quality of in-person conversations because there’s less eye contact, which makes a person miss the subtle but essential social interactions, i.e., facial expressions and tone of voice. 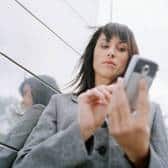 Memory Formation: The Stockholm’s KTH Royal Institute of Technology study shows that constantly checking messages or emails via your phone interferes with long-term memory formation because your brain isn’t given the rest it needs. What can you do to make sure your smartphone isn’t damaging your relationships? Turn off the email bell and pop-up message so your brain doesn’t constantly have to decide whether or not to interrupt your task. Create set times to check your emails and messages. Schedule phone-free times to start and finish important tasks. Turn your phone off and put it away when talking with someone in person. Do you find that technology is controlling your behavior? It’s not too late to regain control. Seeking the help of a mental health professional can help you learn to redefine and focus on what is important. If you live near Portland, OR/Vancouver, WA please contact my office and schedule an appointment. Not only can your health improve, so will your business and personal relationships.